The Main Hall is suitable for large events such as dances, concerts or large social occassions. It is approximately 7.15 x 13.9 metres. The maximum capacity varies with layout of the room. 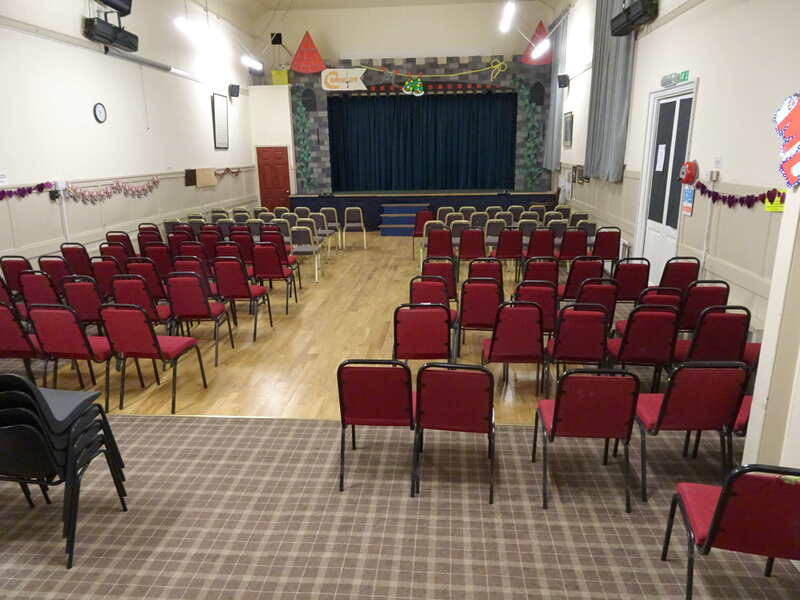 In concert format with rows of chairs the working capacity is 125; for Ceilidhs and the Community Cinema the working capacity is about 80. An audio system including a Loop Induction element is available. See audio notes for further information. The hall houses a piano. The temperature control for central heating is near the double doors that lead to the vestibule. It should not be set above the marked maximum and must be returned to the minimum before leaving the Hall. 86 seats are available in the Main Hall, Supper Room and store room (between the gents and ladies toilets). With special arrangements, a further 82 seats can be made available. There are 26 fold-up tables - 68.5cm x 91cm (14), 68.5cm x 182cm (6), 76cm x 182cm (6). At one end of the hall is a raised stage approximately 6.2 x 3.4 metres. Stage lighting is available, but its usage will require special arrangement. Adjacent to the stage is access to the basement. Other than the Drama Group and maintenance, access is not permitted to this area. 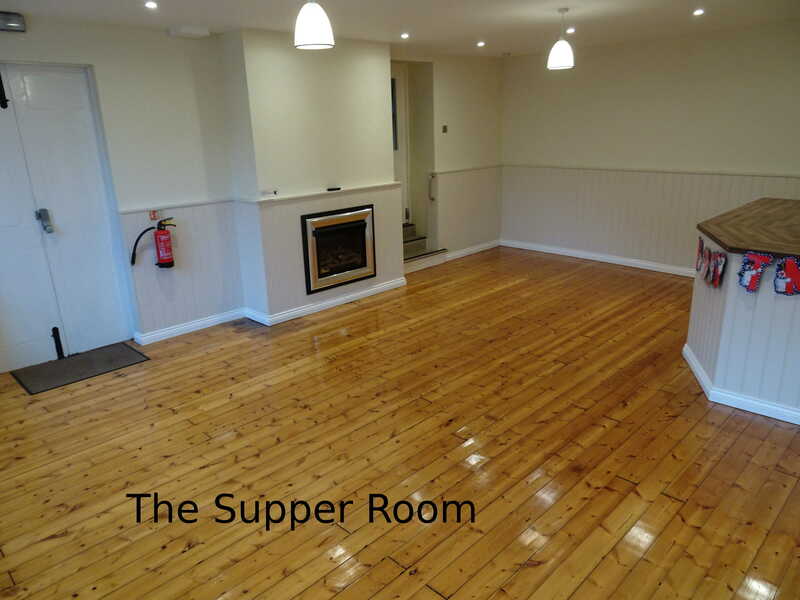 The Supper Room is suitable for smaller events or as a bar, when used in conjunction with the Main Hall. It is approximately 5 x 7.2 metres, including a fixed bar roughly 3.1 x 1.4 metres. This houses a wine chiller and over 200 glasses (approx 70 wine, 45 flutes and over 100 pint and half pint glasses). A gas fire, operated by a remote control, is available in this room should additional heating be required. Instructions are on the shelf above the fire. A STAS picture hanging system is available for temporary display of artwork. The Library is accessed by a flight of stairs through the Supper Room. It is suitable for small meetings and measures approximately 4.2 x 5.1 metres. It has a table, chairs and a conventional gas fire. The Kitchen is accessed either through the Supper Room or through the external kitchen door. It is available for use by anyone booking one or more of the above rooms. It has a large fridge, 2 kettles and 2 water boilers (1 x 10 litre and 1 x 20 litre), a microwave, an electric cooker and a dish washer. A large selection of crockery and some cutlery is available along with teapots, jugs, tea-towels, table cloths and trays. There is an electric heater, which can be turned up as needed. When not in use, the heater should be left powered on, but at its lowest setting which provides frost protection. There are no consumables for general use. 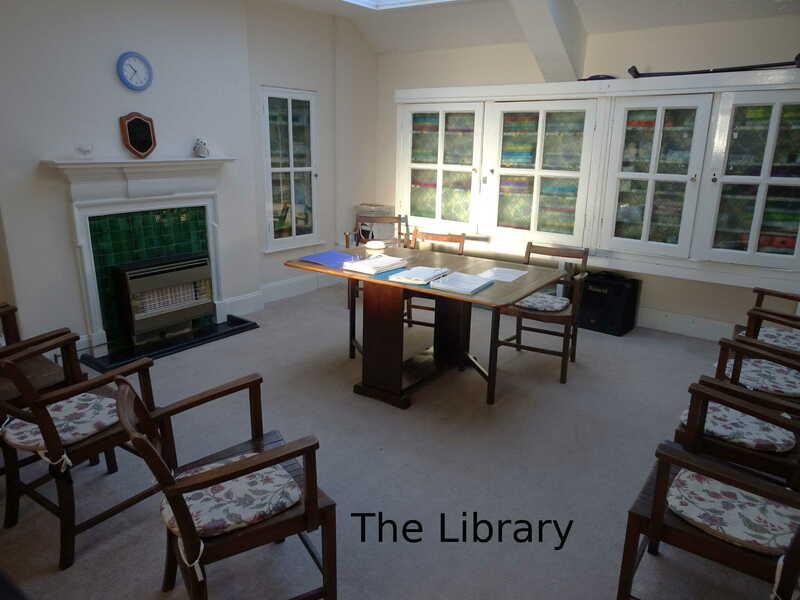 The RBL Room: There is a further room upstairs under the control of the Royal British Legion. This is used by the Art Group and Parish Council meetings, but is not normally available for other bookings. Toilets: Male, Female and Disabled toilets are available from the vestibule. A further unisex toilet is available on the 1st floor outside the Library. We do not have a nappy disposal service. Used nappies should be removed from the premises and not placed in Hall bins. 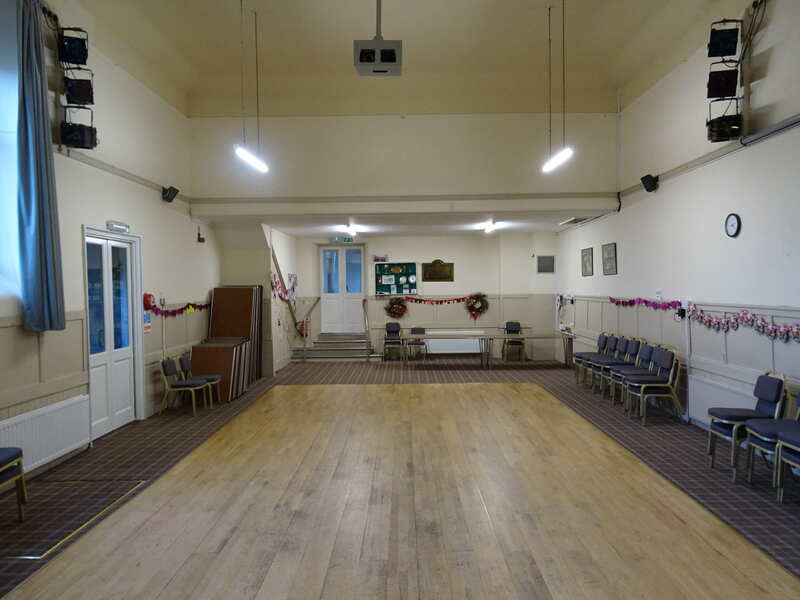 The Hall is run as a charity by volunteers. Please respect this and ensure that you leave the rooms as you find them, turning off/down heating as instructed above, returning any furniture to its original location and clearing away any waste material. There are waste and re-cycling bins outside the kitchen. Please remove any excessive amounts of waste from the site. Disabled Access: The Main Hall/toilets and Kitchen are at ground level, accessed via a double external door and a single external door respectively. Differing ground levels means there are a couple of steps between the Hall and the Supper Room, with a further two steps between the Supper Room and the Kitchen. The Library is accessed via a flight of steps from the Supper Room. An emergency exit from the Library is available through the RBL Room and a flight of steps leading down to the kitchen. No lifts are available. First Aid: There are first aid kits in the kitchen and on the stairs leading to the basement. Users are asked to replace anything that they have used. Cleaning Up: In the hallway between the Supper Room and the Kitchen is an understairs cupboard, where you will find a hoover, a mop and pan & brush. Alcohol: A Premises Licence is displayed on the notice board in the vestibule. Public Video Screening Licence: This licence is displayed on the notice board in the vestibule. Music Licence: Our PRS licence covers ‘the public performance of musical compositions on behalf of songwriters, composers and music publishers’. Our PPL licence covers ‘the public performance of recorded music on behalf of record companies and performers’. The Hall‘s PPL licence does not cover ‘any third party hire to commercial organisations’ or ‘any individuals earning an income from providing the activity such as aerobics classes, practice and social dance sessions’. Contact Numbers: In case of problems, contact numbers are provided on the noticeboard in the vestibule. The Hall has 12 allotments, three directly behind the Hall and nine across from the Ember path. All are currently occupied and there is a waiting list. Allocation is restricted to Warkworth residents only. The charge is £15 per year. An Allotment Agreement covers their usage.